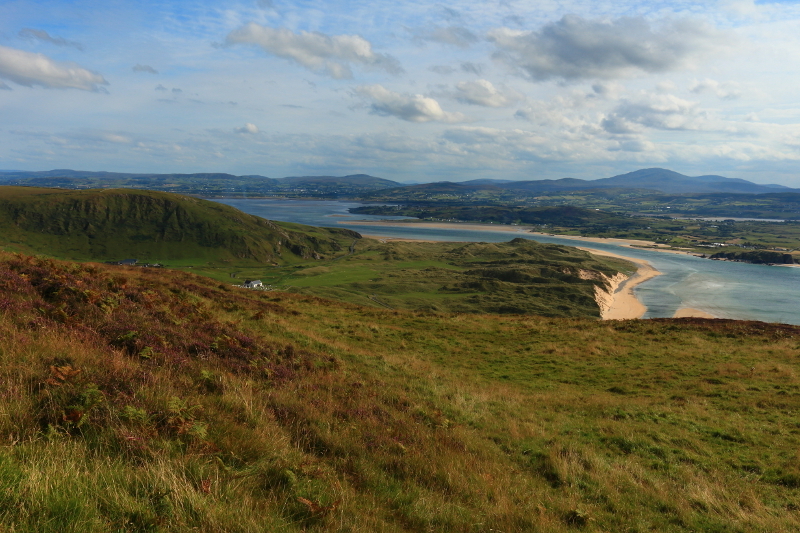 Picture from Aidy : Five Finger Strand, Trawbreaga Bay and Slieve Snaght. Picture: Five Finger Strand, Trawbreaga Bay and Slieve Snaght. Viewed from Five Finger Strand below, Soldiers Hill appears as an impressive cliff. As mentioned by Peter Walker, there is a viewing point high on the hill which provides easy access to its hummocky top after crossing the stile behind the parking area. A very short walk to the top - 10 or 15 minutes, but breathtaking views. On the sunny late August day I visited, the hilltop was covered in bright purple heather, with views beyond over the beach below, southwest to Binnion Hill, Dunaff Head, the Urris Hills, Horn Head and the Derryveagh Mountains. Good views to the north too along the northwest coast of Inishowen. Coming over a small rise at the top, I surprised three buzzards feasting on a pigeon just a few feet in front of me. They were a magnificent sight taking off so close by.